A 911 call placed from inside a Wisconsin home on Monday, which led police to discover teen girl Jayme Closs missing and her parents deceased, apparently came from her mother’s cell phone. KARE 11 reports that the Barron County 911 dispatch log was released Friday and indicated a call to 911 came from the cellphone of Denise Closs at close to 1 a.m. on Monday morning. Barron County Sheriff Chris Fitzgerald indicated earlier this week that the caller didn’t speak to the 911 dispatcher but there were apparent noises of distress in the background. The dispatch log noted “a lot of yelling” in the background. According to the call log, the 911 dispatcher called the cell phone number back numerous times but didn’t receive an answer. Within four minutes from the time the initial call was made, officers arrived at the home, but Jayme was already gone. Inside the home, authorities found the lifeless bodies of 56-year-old James Closs and his wife, 46-year-old Denise Closs. Both deaths have been ruled a homicide and both victims died from gunshot wounds. PINGED TO THE ABOVE ADDRESS. ADVISED 317, 325, & 329. VOICEMAIL INDICATES THE PHONE LISTS TO DENISE AT THAT ADDRESS. TRIED CALLING SEVERAL MORE TIMES AND DID NOT RECEIVE AN ANSWER. ATTEMPTED TO CALL THE LAND LINE AT THE RESIDENCE BUT THE PHONE HAS BEEN DISCONNECTED. 1:03 329 ADVISED OF A POSSIBLE SUICIDE ATTEMPT. REQUESTED ASSISTANCE FROM BARRON PD. ADVISED 656. 1:03 PAGED 501 & 1ST RESPONDERS. 1:04 329 REQUESTED TO HAVE EMS STAGE. PAGED EMS FOR AN APPARENT SUICIDE. [118 – 10/15/2018 01:04:17] 325 ADVISED ONE MALE DOWN, MULTIPLE ROUNDS SPENT. REQUESTED THAT ADMIN BE NOTIFIED. [115 – 10/15/2018 01:05:19] 317 REQUESTED ERT BE PAGED OUT. ADVISED THE DOOR HAS BEEN KICKED IN. ADVISED THAT THE MALE WHO IS DOWN HAD ANSWERED THE DOOR. UNKNOWN IF ANYONE IS MISSING. [115 – 10/15/2018 01:07:23] 317 ADVISED THEY WOULD BE CLEARING THE HOUSE. LAW 1 CLEARED. [115 – 10/15/2018 01:08:10] 317 ADVISED TWO SUBJECTS DOWN. [115 – 10/15/2018 01:11:02] 317 REQUESTED THAT 501 RESPOND TO THE SCENE FOR TWO SUBJECTS DOWN, UNRESPONSIVE. [115 – 10/15/2018 01:19:27] 301 REQUESTED THAT 100 RESPOND WITH THE COMMAND POST. 301 REQUESTED 303 HAVE ONE SEARCH TEAM READY TO GO. ADVISED TWO SUBJECTS DOWN, NO GUN LOCATED AT THIS TIME. 1:38 301 REQUESTED PHOTOS OF THE PROPERTY. 1:54 317 ADVISED ERT REQUESTING POLE CAM. [115 – 10/15/2018 01:32:00] 303 REQUESTED THAT 301 GRAB THE DRONE. [115 – 10/15/2018 02:00:59] 325 ADVISED ___ AND ___ WERE ASKED TO LEAVE AS THEY WERE DRIVING BY MULTIPLE TIMES. [115 – 10/15/2018 03:05:47] STATE PATROL ADVISED THAT ___ CAR 64 AND ___ CAR 52 WOULD BE RESPONDING. [115 – 10/15/2018 03:18:09] 328 AND 366 ARE ENROUTE TO 504 24 1/2AVE. [118 – 10/15/2018 03:27:52] ENTERED JLC AS A MISSING JUVENILE. [115 – 10/15/2018 03:57:47] 321 REQUESTED TO CONTACT AN FBI FIELD AGENT FROM EC. [118 – 10/15/2018 04:02:09] SENT A TTY TO EAU CLAIRE COUNTY REQUESTING THEIR ASSISTANCE WITH 911 CALL CLEAN. [115 – 10/15/2018 04:19:18] 301 ADVISED DEPUTIES WOULD BE 10-76 TO ____ ST.
[115 – 10/15/2018 04:25:57] MADE CONTACT WITH SECURITY AT ST. CROIX CASINO AND REQUESTED THAT THEY MAKE CONTACT WITH 303. [115 – 10/15/2018 04:32:22] 328 ADVISED UNITS CLEAR FROM THAT RESIDENCE. 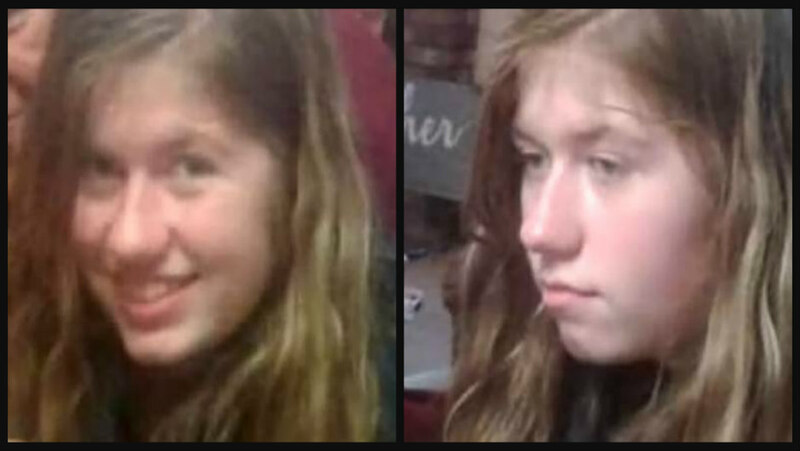 OUR AGENCY IS ATTEMPTING TO LOCATE A MISSING 12 YEAR OLD, JAYME L CLOSS, DOB: 07/13/2005. UNABLE TO ISSUE AN AMBER ALERT AT THIS TIME. SENT ATL TO THE ENTIRE STATE OF WISCONSIN. [115 – 10/15/2018 05:30:19] 366 ADVISED OUT AT JENNIE-O TURKEY STORE. [106 – 10/15/2018 08:47:18] VICTIM’S _____CALLED, WILL HAVE 301 CONTACT ___. [108 – 10/15/2018 09:40:20] 321 ADVISED 315 WILL HAVE SCENE CONTROL AND ALL OTHER UNITS WILL BE CLEAR SHORTLY. [117 – 10/15/2018 12:13:39] FAXED PRESS RELEASE AND INFORMATION TO ONTONAGON COUNTY SHERIFF’S DEPT, ADV 308 WOULD BE CONTACT PERSON FOR BNSO. [108 – 10/15/2018 12:15:13] 309 HAS A DOG FROM THE RESIDENCE AND IS ENROUTE TO THE OFFICE..
BUILDINGS AND HOUSE THERE AND THEY ARE CLEAR. 100 WOULD LIKE BARRON FIRE AND ALMENA FIRE FOR THE SEARCH. Barron County Sheriff Chris Fitzgerald confirmed that no guns were found in the home and that authorities are working on the expectation that Jayme is alive. Detectives interviewed people at Jayme’s school, Riverview Middle School, where she runs cross-country. They also reportedly checked her social media accounts. They’ve found nothing to indicate the girl was in any kind of trouble. Her parents worked at a turkey factory in Barron and so far, authorities have not indicated anything to suggest they were in any kind of trouble. According to family members, Jayme was last seen at a birthday party on Saturday afternoon. They said nothing seemed out of the ordinary with the teen. Jayme is described as a white female who stands 5-feet tall, weighs around 100 pounds, and has green eyes and strawberry blond hair. Anyone with any information on Jayme’s whereabouts is urged to contact a tip line made specifically for her case at 1-855-744-3879.